Western Digital's been churning out these My Book external hard drives in all sorts of configurations, but this 1 and 2TB Studio Edition IIs seem to be the most feature rich yet. 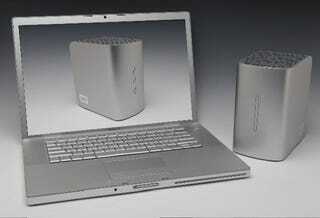 It's got FireWire 400/800, eSATA, USB 2.0, RAID 0 or 1, and Mac support (you can also reformat it for PCs). Looking at Western Digital's Editions page, these come equipped with all the features except for remote sharing and networking, because there's no network port.